-If you're elderly and frail, time to bump up your Vitamin D intake. That seems to be the message from a new study out of Oregon State University. CORVALLIS, Ore. -- A new study concludes that among older adults -- especially those who are frail -- low levels of vitamin D can mean a much greater risk of death. The randomized, nationally representative study found that older adults with low vitamin D levels had a 30 percent greater risk of death than people who had higher levels. Overall, people who were frail had more than double the risk of death than those who were not frail. Frail adults with low levels of vitamin D tripled their risk of death over people who were not frail and who had higher levels of vitamin D.
"What this really means is that it is important to assess vitamin D levels in older adults, and especially among people who are frail," said lead author Ellen Smit of Oregon State University. Smit said past studies have separately associated frailty and low vitamin D with a greater mortality risk, but this is the first to look at the combined effect. This study, published online in the European Journal of Clinical Nutrition, examined more than 4,300 adults older than 60 using data from the Third National Health and Nutrition Examination Survey. "Older adults need to be screened for vitamin D," said Smit, who is a nutritional epidemiologist at OSU's College of Public Health and Human Sciences. Her research is focused on diet, metabolism, and physical activity in relation to both chronic disease and HIV infection. "As you age, there is an increased risk of melanoma, but older adults should try and get more activity in the sunshine," she said. "Our study suggests that there is an opportunity for intervention with those who are in the pre-frail group, but could live longer, more independent lives if they get proper nutrition and exercise." Frailty is when a person experiences a decrease in physical functioning characterized by at least three of the following five criteria: muscle weakness, slow walking, exhaustion, low physical activity, and unintentional weight loss. People are considered "pre-frail" when they have one or two of the five criteria. Because of the cross-sectional nature of the survey, researchers could not determine if low vitamin D contributed to frailty, or whether frail people became vitamin D deficient because of health problems. However, Smit said the longitudinal analysis on death showed it may not matter which came first. "If you have both, it may not really matter which came first because you are worse off and at greater risk of dying than other older people who are frail and who don't have low vitamin D," she said. "This is an important finding because we already know there is a biological basis for this. Vitamin D impacts muscle function and bones, so it makes sense that it plays a big role in frailty." The study divided people into four groups. The low group had levels less than 50 nanomole per liter; the highest group had vitamin D of 84 or higher. In general, those who had lower vitamin D levels were more likely to be frail.About 70 percent of Americans, and up to a billion people worldwide, have insufficient levels of vitamin D. And during the winter months in northern climates, it can be difficult to get enough just from the sun. 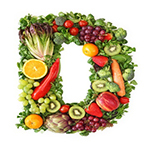 OSU's Linus Pauling Institute recommends adults take 2,000 IU of supplemental vitamin D daily. The current federal guidelines are 600 IU for most adults, and 800 for those older than 70. "We want the older population to be able to live as independent for as long as possible, and those who are frail have a number of health problems as they age," Smit said. "A balanced diet including good sources of vitamin D like milk and fish, and being physically active outdoors, will go a long way in helping older adults to stay independent and healthy for longer." Researchers from Portland State University, Drexel University of Philadelphia, University of Puerto Rico and McGill University in Montreal contributed to this study. It was funded in part by the National Institutes of Health and a grant from OSU.